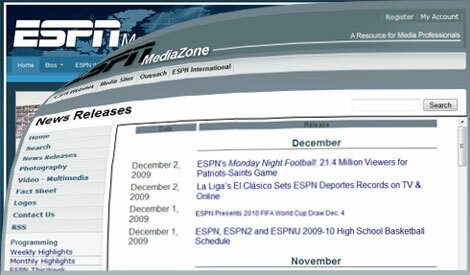 For a few years now, ESPN has had what might be considered an excellent model for a web-based extranet for working media. 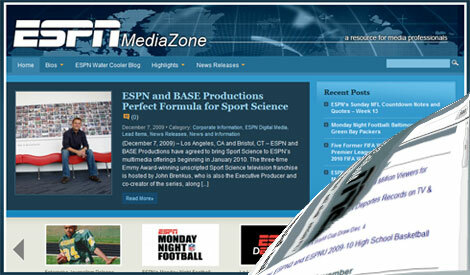 Late last week, the network opened what is called a "soft release" of a new version of the site. This allows them to test some things out with the new site before making a general announcement. 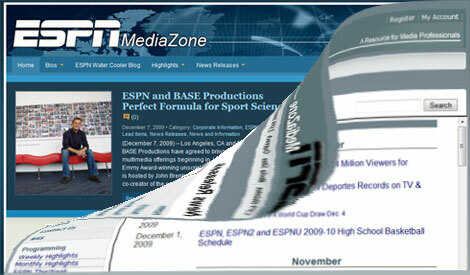 MediaZone 2.0 is visually very appealing and fixes a long-standing problem with a non-working RSS feed for press releases. The new changes, however, may not necessarily make the user experience any better. 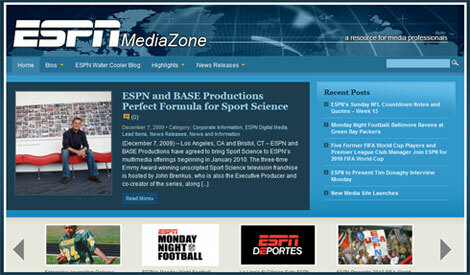 My first visual impression with the new site was visual and my one line e-mail to Chris La Placa, Senior Vice-President of Media Relations for ESPN, was "new mediazone site looks awesome!" And at first glance the site is very visually appealing. 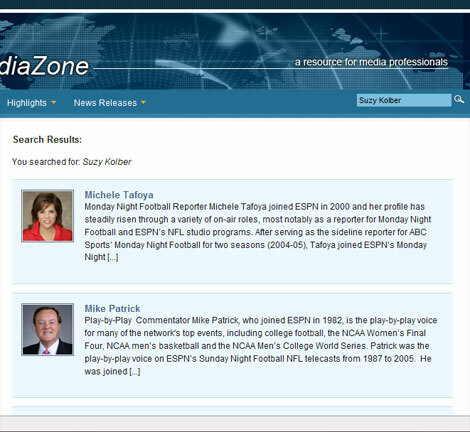 The navigation is clean, you can view press releases by category, and you can also view biographies of ESPN talent and staff. As you navigate through the press release categories, you find that you can not only add a RSS feed for all press releases, but you can also decide to add an RSS feed for specific categories. The search interface is much cleaner. But there is a downside to this new site. 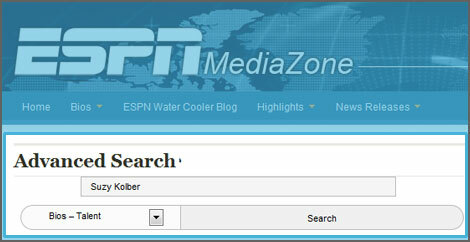 ESPN is using a blogging platform for this site. The only reason this jumped out was when I initially clicked on the Talent bio navigation link, and the very top bio was that of Rick Sutcliffe. I asked ESPN why he would come up first since baseball season was long over. They said it was because they were loading the bios and his was the last one loaded. At that point I knew to ask the question: "Are you using a blog platform." and the answer was "Yes." Specifically they are using WordPress. While WordPress is a very good publishing platform for blogs and offers very rudimentary content management tools, the jury is still out on whether WordPress is the best tool for this or any enterprise grade web site. While many smaller web sites use WordPress to manage their web sites, but there are limitations, much the same as limitations we have found using the Google Blogger platform. The biggest of these is easy reuse and repurposing of the content. While there are programmatic APIs to retrieve data from these platforms, they are not very well documented and not very easy to use. The same holds true when trying to publish content to these platforms (mainly Google Blogger) from different data sources. What is important to note about the screen shot above is that is exactly how it fills my browser window on a laptop. There is no indication how many results have been returned and the one I want is not on the screen. I have to scroll down to see it, and even then I am not done as I then have to click on her name to get the full biography. 1. Click on "advanced search"
2. Enter her name in the serach field. 3. Select "Bios - Talent:" in the drop down list. 5. Figure out why I did not see her biography. 6. Scroll down to see the summary and link. 7. Click on her name to get to the biography. Seven steps, and if I want to write a story on the Monday Night Football crew as a whole, I would have to repeat this process five times! Why? Because this is a WordPress solution, and not a enterprise grade data management/presentation solution that ESPN could have applied Dojo toolkits to in an effort to make this as easy and seamless as possible. 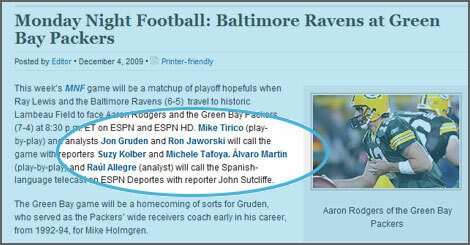 There are other things I have noticed as well that I will share with ESPN offline. Even so, the old tool and now this 2.0 version is far superior to what the other networks offer. 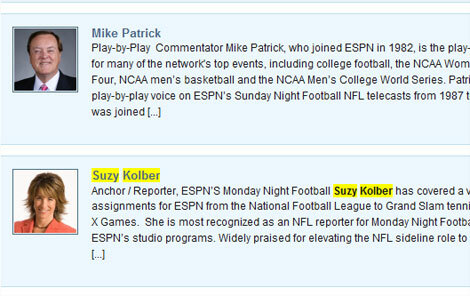 Those networks could and should learn from what ESPN is doing here. Another thing to keep in mind is the team working on this have been working exhaustively for two years on this site, and the issues identified above are NORMAL and TO BE EXPECTED when rolling out a new site. That is why it is called a "soft launch", and I know the ESPN team is hard at work trying to make this site the best possible show case it can be.